The average number of people forced to flee their homes as refugees each year has doubled in the last 20 years compared. In 1997, 33.9 million people globally were forcibly displaced by war, persecution or violence each year, compared to 65.6 million in 2016 and “it remains at a record.” (United Nations Refugee Agency – UNHCR). These were individuals who were forced to flee their homes to escape persecution, war or severe human rights abuses. Often, they can never return home and about one third are officially recognized as refugees. 84% are hosted by developing countries. Developing regions hosted 84 per cent of the world’s refugees under UNHCR’s mandate, with about 14.5 million people. 55% of refugees are from 3 countries. 9 million people hosted by Turkey. For the third consecutive year, Turkey hosted the largest number of refugees worldwide, with 2.9 million people. It was followed by Pakistan (1.4 million), Lebanon (1.0 million), the Islamic Republic of Iran (979,400), Uganda (940,800), and Ethiopia (791,600). 2 million new asylum claims. The number of new asylum claims remained high at 2.0 million. With 722,400 such claims, Germany was the world’s largest recipient of new individual applications, followed by the United States of America (262,000), Italy (123,000), and Turkey (78,600). In 2016, UNHCR referred 162,600 refugees to States for resettlement. According to government statistics, 37 countries admitted 189,300 refugees for resettlement during the year, including those resettled with UNHCR’s assistance. A refugee is someone who has been forced to flee his or her country because of persecution, war or violence. A refugee has fear of persecution for reasons such as race, religion, nationality, political opinion or membership in a particular social group. Most likely, they cannot return home or are afraid to do so. War and ethnic, tribal and religious violence, sexual orientation and gender violence are leading causes of refugees fleeing their countries. Refugees must qualify for entry under Canada’s laws and must pass medical and security checks before they can come to Canada. What types of refugees does Canada recognize? Under the GAR Program, refugees are referred to Canada for resettlement by the United Nations Refugee Agency (UNHCR) Individuals cannot apply directly. Individuals must register for refugee status with the UNHCR or state authorities to be considered by a referral organization. A GAR’s initial resettlement in Canada is entirely supported by the Government of Canada or the province of Quebec. This support is delivered by non-governmental agencies called service provider organizations funded by IRCC, of which ISSofBC is one. GARs receive support for up to one year from the date they arrive in Canada, or until they are able to support themselves, whichever happens first. If an individual is a PSR, it means that a group of people in Canada have volunteered to help the individual adjust to life here once resettlement has taken place. The sponsorship group will assist the individual with finding a place to live, financial support, social and emotional support and food and clothing. The sponsorship group also agrees to support the PSR for one year after they arrive or until they can support themselves, whichever comes first. The UNHCR identifies the refugees. The Government of Canada provides up to six months of income support. Private sponsors are responsible for another six months of financial support. The sponsorship group also gives up to a year of social and emotional support. The Interim Federal Health (IFH) Program and provincial health care cover refugees for the length of the sponsorship (one year). Canada offers refugee protection to individuals in Canada who fear persecution or who would be in danger if they had to leave. These individuals are generally referred to as Refugee Claimants as they must make a claim for refugee protection to the Immigration and Refugee Board of Canada (IRB) to legally stay in Canada. How many refugees does Canada accept? The Canadian government sets an annual target for resettling refugees in the various categories. In 2016, Canada resettled 46,700 GAR and PSRs, a record for Canada since 1978 when the Immigration Act went into effect; this was a 133 percent increase since 2015 (UNHCR Canada). Canada has three different resettlement programs. Of the resettled refugees that arrived in 2016, 51% were Government Assisted Refugees (GARs), 40% were Privately Sponsored Refugees (PSRs) and 9% arrived with the Blended Visa Office-Referred Program (BVORs). How many refugees does British Columbia accept? In 2017, British Columbia saw a 64% drop in the number of Government Assisted Refugee (GAR) arrivals in comparison to 2016. On the other hand, Settlement Orientation Services (based in Vancouver, B.C.)  saw 76% increase in the number of Refugee Claimant arrivals to B.C. in 2017 compared to 2016. In terms of housing, 48% of GARs permanently reside in Surrey, with 17% residing in Burnaby in 2017 while 38% of Refugee Claimants found permanent or temporary housing in Vancouver, with the second top location being Surrey at 18%. 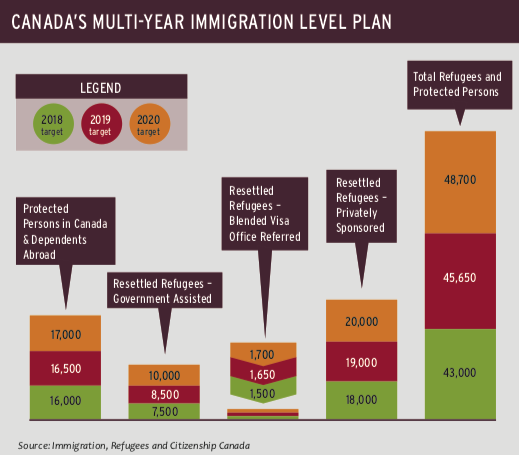 Looking ahead, Canada’s Multi-Year Immigration Levels Plan shows an increase in the targeted number of Privately Sponsored Refugee arrivals, approximately exactly double the target in comparison to GARs for each year from 2018 to 2020. How many refugees are expected to be resettled between 2018 and 2020? On November 1, 2017, Immigration, Refugees and Citizenship Canada (IRCC) released details on its multi-year Immigration Levels Plan. Canada will welcome 310,00 new permanent residents in 2018, 330,00 in 2019 and 340,00 in 2020. Outlined in this plan are targets for refugees and protected person arrivals to Canada. What support do Government-Assisted Refugees receive? Government-Assisted Refugees (GARs) are refugees who are selected from abroad and resettled to Canada, arriving as permanent residents. The federal government is responsible for their selection and initial settlement in Canada. For example, GARs are eligible for federal government income support through the Resettlement Assistance Program (RAP) for up to one year after arrival. 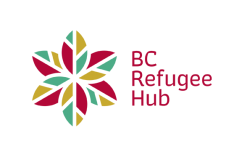 referrals to other refugee and settlement programs. The level of monthly financial support is generally based on the prevailing provincial social assistance rates in the province where the refugees settle. Financial support can last up to one year after a refugee arrives in Canada, or until they can support themselves, whichever occurs first. What support do Privately Sponsored Refugees receive? Sponsoring groups agree to provide the refugees with care, lodging, settlement assistance and support for the duration of the sponsorship period. Normally, this is 12 months starting from the refugee’s arrival in Canada or until the refugee becomes self-sufficient, whichever comes first. In exceptional circumstances, the visa officer may determine that the refugee requires more time to become established in Canada and will ask the sponsoring group to extend the sponsorship period to a maximum of 36 months. The sponsoring group has the option of refusing the request for an extension of the sponsorship period. However, the sponsoring group risks having the case refused as a result. helping in the search for employment. Sponsoring groups must reside or have representatives in the community of settlement (i.e. in the community where the sponsored refugees will live). The intent is to have a group of persons helping refugees to get established in the community and not one person acting alone. What support do refugees arriving under the Blended Visa Office-Referred program receive? The BVOR program is a combination of the GAR and PSR programs with The Government of Canada giving up to six months of income support and the private sponsors give another six months of financial support. They also give up to a year of social and emotional support. For more information on this unique program, click here.